The Legend of Zelda Four Swords Anniversary Edition: OUT NOW! The Legend of Zelda Four Swords Anniversary Edition will come out for the DSi and the 3DS shops on September 28, 2011 and it will be free. That looks like the GBA version. Which is fine with me! @Jargon Nope, it's a DSiWare title and everyone needs to have downloaded it to play, so only DSi, DSi XL and 3DS. Laaaaaaaaaame. If it's free, why not allow single "cart" multiplayer? Those of you familiar with DSiWare vs. DSiWare on the 3DS, what does this mean for the aspect ratio? Any chance 3DS owners will get to view it at its optimum resolution (like with the NES games), or will it be slightly stretched like Shantae, Aura-Aura Climber, etc? Definitely looking forward to this. The additional content is a very cool feature. @Jargon Dunno, but I've definitely read that all players need to have downloaded it. EDIT: @TriforceBun I would imagine that it's slightly stretched like DS retail games and DSiWare titles. I haven't heard anything for sure, but I haven't heard anything to the contrary either so I would assume it's like any other DSiWare title. 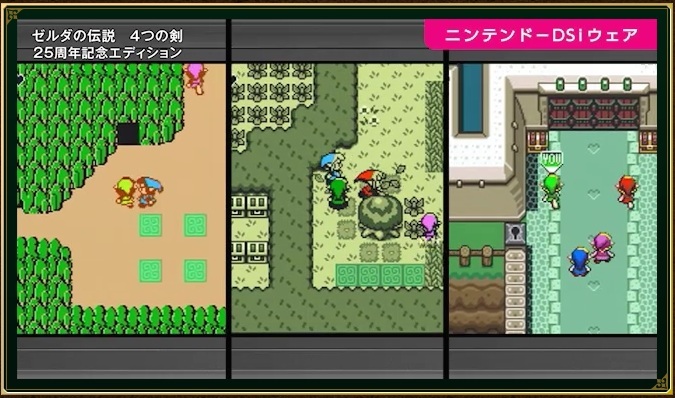 The slightly different visuals for Link in each retro stage is a very nice touch. Sigh, much like Four Swords Adventures I'll only be experiencing 2 player then. @Jargon Much like Four Swords Adventures I'll only be experiencing it one player. But I've played through it three-player before (albeit seven years ago), so at least there's that. I'm just glad they're adding a single player mode and some new stages (and the Master Sword and Hurricane Spin)! Much more than I expected for a free download. I'm pretty impressed, even if they did ignore download play and online. Awesome, never did get to play the GBA one. Well I'm glad there's a singleplayer mode. Will download on my two devices. @Jargon I don't get it... if it is free, why would you be worried that everyone needs to have it? Everyone can download it for free. Or are you not getting the other 3DS until after Feb. 20th and then it is no longer free? It'll probably be cheap enough. Maybe. My family only has two devices capable of downloading it: a 3DS and a DSi. We have 3 other DS's, so we could play 4 player if they allowed single "cart" multiplayer, but as it is, we can't. Maybe my niece will get a 3DS for Christmas and then we could at least play 4 player. Oh yeah I see now. I didn't actually read the thread and was just assuming that this was 3DSWare. So apparently this is out in Japan and Europe. Go get it while I wait (im)patiently. We got the ambassador games early so there is a fleeting hope that FS could come early. But in all likelihood we'll get it tomorrow. NOA said it would be out on the 28th, and it's out in other regions so I think (hope) we will get it today. Oh, right, today is the 28th. Hype!